Learn the real history of translite from the man who made all three kinds. 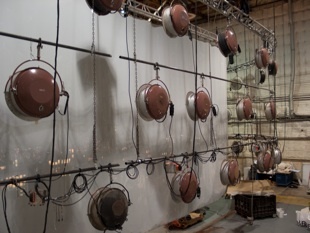 Translite Background from the back side showing typical rigging of skypan lights on stage. Translite is a type of motion picture background. It is a large still picture made to continue a scene, typically seen through a doorway or window. It is the most distant object from camera on a motion picture set. In the 1950’s Kodak made a black and white display film on acetate with a dual emulsion ready for darkroom use. Each side of the film had an emulsion, so that the pictures printed on it were composed of two images, one lighter than the other. This density allowed light from the rear to pass through and made a very long brightness range possible. Color was added by hand tinting the photo. It had a rough matte surface to allow this coloring. In the 1980’s Kodak introduced Duratrans. It was a full color display film on polyester. It was also called translite in the industry, so we are nicknaming it translite 2. Utilizing a special longer development time, the images produced also gained contrast and were suitable for rear lighting. The first version of Duratrans was printed by projection in mural darkrooms. Later, as technology changed, a new version was introduced that was designed for exposure with special laser “darkroom in a box” imaging. The film was still developed in a film processor with a longer developer time. The newer type had much less diffusion in it. This presented a problem because the stage lights could be seen through the film unless diffusers were used or if the lights were flourescent. The surface facing the set was also high gloss. To remove the reflection of shiny speculars in the images, matter lacquer was applied as a last step. This spraying presented health risks for the workers. Today we introduce Translite3™. We have used the same polyester base film as Duratrans in a wider panel and we put the image on with UV curable ink. The result is a scratch resistant diffuse image print that does not require matte spray. It looks very much like Duratrans but does not require wet processing or matte spraying, making it a pleasure to use for the technicians and allowing fewer seams with its wider panels. The achievable density scale is actually longer than the silver halide cousin Duratrans. Current digital capture often demands a longer brightness scale. And the ink image does not show the glowing red shapes of the skypan lights used behind like Duratrans. Translite3™ is the next generation of translite backgrounds. 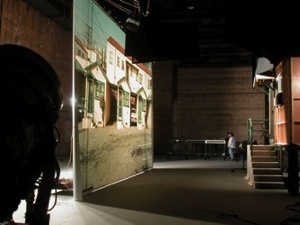 Feature film “Be Cool” used a translite on the motel set.